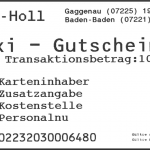 Whether in Baden-Baden, Or at Rastatt Baden-Airport, Taxi ride without cash is with Taxicard of taxi Holl the optimal solution. 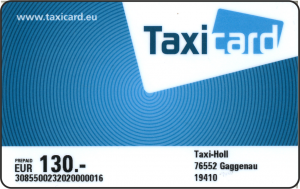 The card is übertragbar (unpersönlich) and can be repeatedly used throughout Europe for all partners. From the MAP value after each payment of the appropriate fare is deducted or. created a monthly bill. Basically there are two types of taxi Cards. 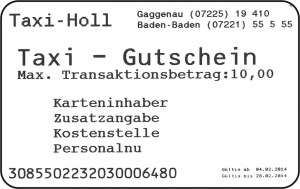 Einmal die Taxicard Prepaid, that is charged with a balance and this can be followed in accordance with, and the Taxicard DRIVING CHECK, when done rides on monthly bill. The Taxi Card PREPAID also comes as a gift to good. Überraschen your loved one with a card and give you taxi cab rides. Them the same comfort kits Publications Order Online. The once Taxicard is printed on cardboard and has a magnetic strip on the billing information is stored. The invoicing is done at end of month. If you have any further questions, Do not hesitate to ask, to contact us. We are always happy to grouting.